Hello! 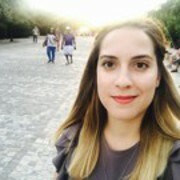 I am Kalliopi, currently completing my PhD at King's College London in Inflammation and Regenerative Medicine, and I also have a MSc in Neuroscience and Developmental Neurobiology and a BSc in Molecular Biology and Genetics (KCL, DUTH). I am a very supportive, friendly and patient Biology tutor, covering A-levels and GCSE. My tutorials are always carefully prepared and structured with teaching tailored to the needs of the individual student and exam board. I have extensive experience teaching both A-level and GCSE student's as well as BSc and MSc level student's. My teaching approach focuses in building the student's confidence through in depth understanding of the curriculum and frequent review of the covered material. I have extensive experience in teaching Biology in AS and A-level as well as at Degree level. I cover all Biology subjects, including Physiology, Biochemistry, Cell biology, Genetics, Neuroscience, Developmental Biology, etc.